Research projects in Dr. Hinrichs' laboratory are focused on three distinct areas of interest: molecular microbiology, regulation of gene expression and protein structure. A method has been developed for inhibiting tumor specific proteins that initiate cancer in certain types of tumors. The method incorporates knowledge regarding biochemical abnormalities in cells following changes in the chromosome, called translocations. These chromosomal events result in the production of new combinations of proteins that do not exist in normal cells. These combinations, termed chimeric proteins, are optimal targets for development of therapeutic molecules. A similar project is focused on identifying chemicals that could be used as antibodies. The drug target is primase, an essential enzyme that generates abort primers during DNP replication. Significant advances have been made using structural biochemistry and molecular modeling to develop lead compounds that were used to test and develop a model system. This work has lately evolved into a new project focused on inhibiting the activity of essential replication enzymes in bacteria. The project envisions the need for a new class of antibiotics in the future or for antibiotics that can be used to treat genetically engineered bacteria released by terrorists. Molecular modeling was used to suggest targets for mutagenesis and confirmation of function in vitro. The work involves collaboration with a wide range of scientists from electrical engineering to chemistry. A separate project is focused on the development of the next generation of molecular diagnostic tests for the detection and identification of infectious diseases. Dr. Hinrichs' research is also listed under High Risk Organisms. e Mycobacterium species). Original work in my laboratory showed that the internal transcribe spacer region within the rDNA complex was a useful target for the identification of both the common and uncommon fungal and mycobacterial species. 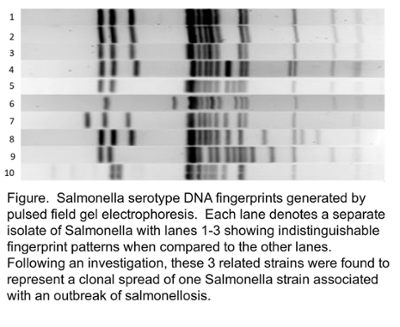 Subsequent work has been in utilization of whole genome sequencing in collaboration with bioinformaticians to analyze microbial pathogens to investigate foodborne and nosocomial outbreaks as well as to monitor for genetic targets to identify the presence antimicrobial resistance. Our laboratory conducts research related to acute phase proteins and their role in the inflammatory process. Acute phase proteins are produced by the liver in response to proinflammatory cytokine stimulation, primarily interleukin (IL-) 1, IL-6, and tumor necrosis factor alpha (TNFα). Our laboratory has focused on the acute phase protein serum amyloid A (SAA). Within 18 hours following stimulation, SAA is produced by the liver and blood levels reach 1000 fold higher concentrations than levels prior to stimulation. The function of SAA is unknown, although it plays a role in lipoprotein metabolism. Our laboratory has discovered a novel isoform of SAA that is produced extrahepatic and does not occur in the circulation. It was discovered in bovine colostrum and was unique to that fluid in that it was not present in milk five days following parturition. Moreover, a unique N-terminal amino acid sequence found in this bovine SAA isoform was identical for SAA isolated from the colostrum of five different animal species. As with bovine, the new SAA isoform only associated with colostrum and not milk or serum. We have prepared a variety of recombinant proteins and peptides that reflect the novel colostrum-associated amino acid sequence, and have determined that one functional role of this unique isoform of SAA causes increased mucin-3 production by intestinal cells. Mucin-3 is essential for protecting the gut from bucteral adherence, colonization and infection. Based on either diagnostic assays of secreted biological fluids for detection of infection and inflammatory condition or of serum amyloid a isoform from colostrum, we have had twelve issued patents and four pending. These and other findings from our laboratory imply that this heavily conserved amino acid region of the colostrum-associated SAA molecule has an important beneficial function in the health and well being of the neonate, in particular with respect to the protection of the GI tract from pathogens encountered early in life. I have invented, developed and manufactured prototype diagnostic tests for human and veterinary applications as well as established start-up companies to manufacture and market these technologies in collaboration with companies worldwide. My research focuses on the identification, characterization, and engineering of novel antimicrobial agents based on structural, bioinformatics, and functional studies. Our ultimate goal is to develop novel compounds that curb pathogenic microbes, especially difficult-to-kill microbes such as methicillin-resistant Staphylococcus aureus (MRSA). Naturally occurring antimicrobial peptides (AMPs) are universal effector molecules that directly eliminate invading pathogenic bacteria, fungi, viruses, and parasites. In mammals, including humans, such peptides may also modulate the adaptive immune systems. To date, more than 2890 AMPs have been identified in bacteria, fungi, plants, and animals. 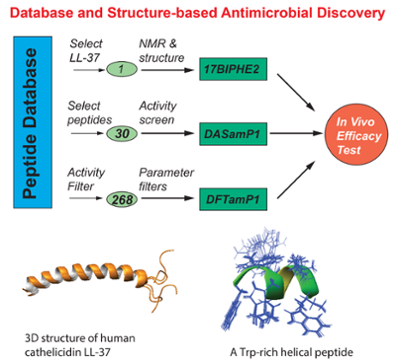 To better manage this information, my laboratory has established the Antimicrobial Peptide database (APD) as a tool for AMP naming, classification, search, statistical analysis, prediction, and design. Our database is also a useful resource for developing novel antimicrobial agents. These miniature proteins are capable of adopting a variety of three-dimensional structures, inspiring our design of natural mimics that benefit mankind. The objectives of our current NIH-funded projects are to develop AMPs into novel antimicrobial agents, including covalent immobilization on medical implants. We are particularly interested in an in-depth understanding of the functional roles of human AMPs and their relationships with human diseases, including cancer. Recently, we have solved high-quality structures of human cathelicidin LL-37 and its important fragments by multidimensional nuclear magnetic resonance (NMR) spectroscopy. Dioctanoyl phosphatidylglycerol (D8PG) has been established as a new and unique membrane-mimetic model, which enables the detection of Phe-PG and Arg-PG interactions. Based on three-dimensional structures, we have identified the most potent region within LL-37 against MRSA, thereby identifying a useful template for designing novel therapeutic compounds against this superbug (US Patent 7,465,784). To elucidate the mechanism of action, we are utilizing a variety of biophysical and biochemical techniques. Our studies will lay the foundation for peptide engineering with a goal to overcome the hurdles (stability, toxicity, and production) on the way to the development of natural AMPs into novel therapeutics. Another research direction of high interest to us is to engineer molecules that control protein-mediated signal transduction pathways essential for bacterial survival or infection in collaboration with colleagues in the Center for Staphylococcal Research. The lead compound will be optimized by combining NMR-based library screening with rational design based on three-dimensional structures of protein-protein complexes.